Wee Yeong Wei, Braema Mathi and Alex Au (not in picture) represented Maruah Singapore at the celebrations organised by the Burmese community in Singapore to mark the 64th birthday of Nobel laureate Aung San Suu Kyi. The event was held at the Burmese temple on Tai Gin Road, on Sunday, 21 June 2009. Sunday, 31 May 2009, Hong Lim Park, Singapore. Organised by Maruah Singapore. Singaporeans from all walks of life, joined by the Burmese community in Singapore, hold a peace vigil for the freedom of Aung San Suu Kyi. Courtesy of Patrick Chng from MARUAH. Please click here for the report on the public consultation organised by MARUAH on the ASEAN Human Rights Body on 11 March 2009. The Straits Times has reported on the public lecture by Professor Vitit Muntarbhorn on a ASEAN human rights body, organised by MARUAH and ASEF. PEOPLE in ASEAN countries who suffer from human rights violations would have better access to justice if there were a regional human rights body they could turn to, a visiting human rights expert said yesterday. Urging the creation of an ASEAN-level human rights commission, Professor Vitit Muntarbhorn said that this would benefit the people of ASEAN “because first, the United Nations is so far away, and second, the national setting may at times be not so accessible in terms of justice”. He did not specify which countries he had in mind. Prof Vitit, a law professor at Bangkok’s Chulalongkorn University, noted that he was not advocating a human rights court similar to the European Court of Human Rights, but a commission. Now, four countries in ASEAN have National Human Rights Commissions: Indonesia, Malaysia, Thailand and the Philippines. Prof Vitit said that a commission at the 10-nation ASEAN level could help articulate ASEAN’s concerns on human rights issues more forcefully, in a way that expressed “our concerns in a good light” without “undermining international perspectives”. Speaking during a seminar at the Asia-Europe Foundation, he said that the commission could also push for more effective implementation of the rules and norms of human rights. Prof Vitit was in Singapore for a two-day workshop organised by the Singapore Institute of International Affairs and the Working Group for an ASEAN Human Rights Mechanism. The ASEAN Charter, which member states had signed at the ASEAN summit here last November, stipulated the setting up of such a commission. Terms of reference for the body will be put up to ASEAN foreign ministers for consideration when they meet in Singapore next month. Prof Vitit, who is also the United Nations special rapporteur on human rights issues in North Korea, said that, although ASEAN was essentially a political organisation driven by economics, it could still address human rights issues in a “creative, innovative and meaningful manner”. Would an ASEAN human rights commission be effective? A seminar participant, Dr Michael Vatikiotis, the Asia regional director for the Geneva-based Centre for Humanitarian Dialogue, pointed to “politics” getting in the way. To many countries in ASEAN, Dr Vatikiotis noted, “human rights is problematic”. Former ASEAN secretary-general Rodolfo Severino, another seminar participant, pointed to two other hurdles. First, to be effective, an ASEAN human rights body needed independent commissioners who could act as checks and balances against other institutions and also its members’ governments. Second, where would the funding come from? To the latter point, Prof Vitit said that the availability of money was not the issue, but its allocation was. 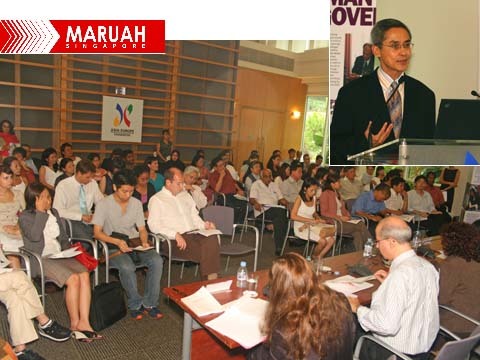 It was a full house, with standing room only, when Prof Vitit Muntarbhorn delivered his lecture “An Asean human rights body: A milestone in the 60 years of the Universal Declaration of Human Rights?” on 11 June 2008. The event was jointly organised by Maruah Singapore and the Asia-Europe Foundation, attended by academics, civil society activists, students, government officials and by ambassadors and other diplomats. A report will follow soon. Meanwhile, photographs of the event can be found here. You are currently browsing the archives for the Event reports category.